On behalf of Zac and my family I would like to thank you for your kindness. 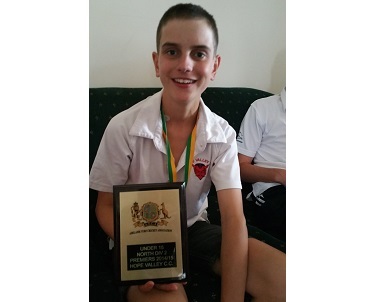 Zac was recently diagnosed with acute lymphoblastic leukaemia and missed the end of season fun associated with being in the under 15 premier team. At the end of year club presentations a collection was taken, donations offered by club members to support our family as we face this battle. It was an overwhelming surprise when we opened the envelope and saw your generosity. Ken has given up work to care for Zac full-time and these vouchers will definitely come in very handy. It is quite a humbling experience and we feel very emotional to receive this sort of care and love from a club. It just goes to show how much Hope Valley Cricket Club is really one big family. We feel the love and thank you all so much. Zac's treatment is going well and he is looking forward to catching up with his cricket mates soon. Thank you. Much love, Ken, Hazel, Zac, Nic and Cam Butler.